New operas are a hard sell. Opera houses fill their seasons with old war horses decorated in gaudy garb called “daring new productions” and then invest in the world premiere of the new contemporary masterpiece that pleases the cognoscenti with its esotericism and baffles the lay audience. Composers write for the future, immortality is their goal, but ignore the average, living audience member who just wants to have a meaningful, relatable experience. 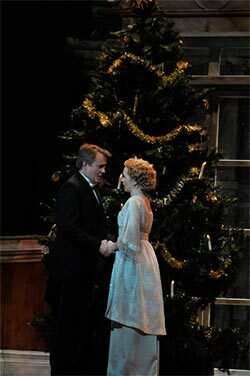 So what a relief is Kevin Puts’ Silent Night, an opera co-commissioned by the Minnesota Opera and Opera Philadelphia, which premiered last year at Minnesota Opera and won the 2012 Pulitzer Prize. 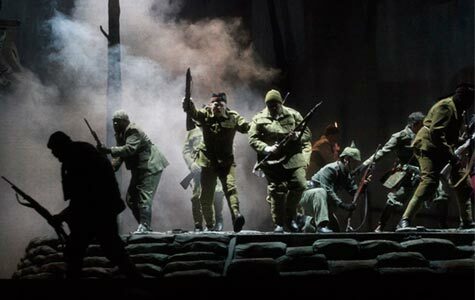 The opera was adapted by librettist Mark Campbell from the 2005 film Joyeux Noel, inspired by the 1914 Christmas truces, when warring soldiers in the trenches agreed to a ceasefire on Christmas Eve. It was a phenomenon that occurred throughout France with German, French, and British soldiers coming together to exchange gifts, play football, and sing songs – a touching cultural exchange when the enemy’s anonymity, important fuel for the propaganda machines, deteriorated. Puts’ score is an irresistible mélange of styles, sounds, and influences masterfully seamed together with Campbell’s story about three very different groups of people who come together to form a common language. The first of many arresting moments in the performance came in the middle of Act I, when each group of soldiers began singing, in cannon, in their own languages until their textures overlapped in a stunning, all-male a cappella carol. There were many other moments just like this, when Puts’ melodies brought the warring factions together in harmony. Without question, the star of Opera Philadelphia’s production, besides Puts and Campbell, is tenor William Burden as the conscripted German tenor, Nikolaus Sprink. To describe Burden as a veteran tenor (he created the role of Sprink) reflects only upon his experience; his high-lying tenor voice is without blemish and technically flawless allowing him to really dig into the core emotions of a scene. He was paired with rising soprano Kelly Kaduce as Anna Sorensen, Sprink’s singing partner and lover. Kaduce’s sensitivity and fiery temperament were the perfect complements to Burden’s clarion sweetness and endearing naivete. He truly believes that music will bring the men together. Contrasting with Sprink’s optimism was the hard-edged reality of the German Lieutenant Horstmayer, who has the most significant character arc in the opera. Initially reluctant to interact with the Scottish or French soldiers during the truce, his heart softens when he discovers that Audebert, the French lieutenant (monochromatically sung by baritone Liam Bonner), lives on the same street in Paris as his favorite restaurant. Craig Irvin sang Horstmayer with a commanding bass-baritone capable of the color change demanded by Campbell’s text. The audience favorite was baritone Andrew Wilkowske as Ponchel, the French barber-turned-soldier, who brightened the battlefield with buffo antics and sincerity. When Ponchel was shot dead after the truce by Jonathan, a Scottish soldier deeply wounded by the combat death of his brother, the Academy of Music resounded with wounded gasps. The reaction was a testament to Wilkowske’s full realization of the role as well as Puts’ ability to create quiet, dramatically charged moments.